I'm busy working on a few projects but I managed to 'create for fun' last night!! I used the gorgeous color palette this week from CR84FN Color Challenge. Here's the pretty palette. I went for a soft vintage feel. I used papers from Webster's and Prima Botanical Collection (love this range!). The sentiment is from Fancy Phrases from Waltzingmouse Stamps. The little teal butterfly I cut out from The Mariposa Stack. I made the flower from vellum using the Tattered Florals Die, I used lots of layers and a brad in the centre, scrunched it all up and rubbed with some distress ink. I drew some simple leaf shapes, cut out, scored the centre and rubbed with green ink. I love how the flower turned out, it's so light! Other: Vellum, brad, Tattered Florals die, die cutting machine, sewing machine, crochet lace, lemon seam binding, doily, trinket pins. Labels: CR84FN15, vellum flower, vintage. Absolutely beautiful Clare. The flower is a stunner. Oh my.....did you know that there is a lot of your wok in my favorites folder? This one goes in it too. This is one of my fvorites; so elegant. I just bought some vellum and that flower is pure beauty,.....A fabulous idea. Thanks so much for playing along at CR84FN! A beautiful, beautiful card, and a gorgeous flower, the colour is lovely. Beautiful card with such a gorgeous flower, Clare. Your card is so luscious with the papers and those colors. Please send me your address again, part of it is worn so I can not read it. I found something I want to send you! Wow Clare - just Gorgeous! It's a winner for sure! Beautiful card Clare. Vellum makes beautiful flowers - doesn't it? I've been using vellum for years to make my flowers and they always turn out more realistic than using paper. I also use cold porcelain, but that takes much longer. I really have to work on my typing skills; sorry for all the mistakes in my comments! Another gorgeous creation loving that tissue paper flower! So soft and pretty Clare. Love it. STUN-NING!!! Absolutely gorgeous Clare. WOW!!! I love that big pretty yellow flower! Great take on the challenge colors! Thanks so much for playing along with CR84FN! This is breathtakingly beautiful. I adore the vellum flower. I am not a fan of it in the traditional vellum on card sense but in flower form like this I am totally smitten! Wow!! This is totally gorgeous. 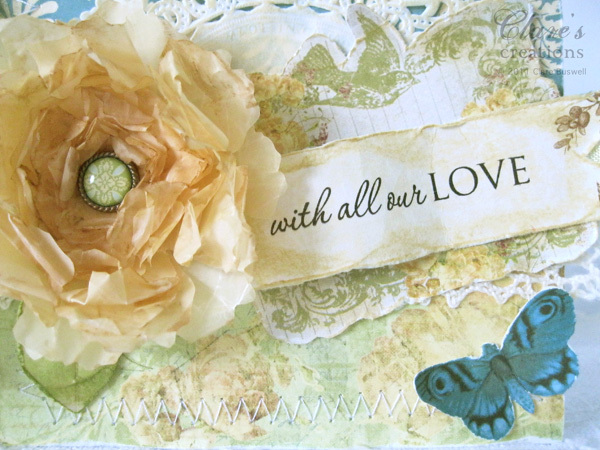 Such a wonderful 3D rose, and beautiful details with the stitching, lace, ribbon, butterfly!! Fab! Thanks so much for playing along with CR84FN! This is absolutely gorgeous, Clare! Lovely mix of patterns and your flower is fabby! Thanks for playing along with CR84FN this week! Wow, what an absolutely stunning card, Clare! I love that gorgeous rose! What a pretty flower, I'm going to have to try that vellum method! 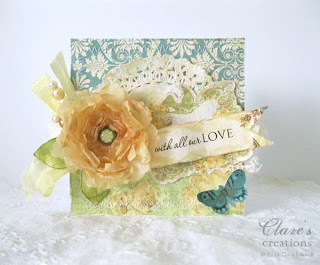 Love this card and that vellum flower! Absolutley gorgeous! Love the flower!!! So Gorgeous! Love the flower! Gorgeous, love the soft colours and the flower is beautiful. Clare, LOVE the vellum flower and the FAB papers you used! So soft and romantic! THX for playing with us at CR84FN! Oh, this is lush! 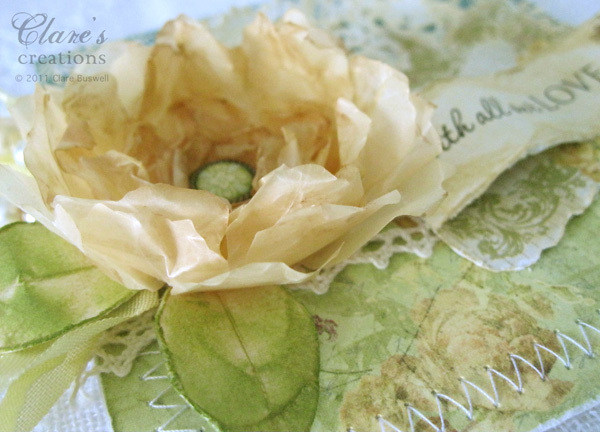 What a gorgeous combination of softly colored papers, and the vellum flower is beautiful!